Just one of the many beautiful rivers in the Connemara region, this one at the village of Maam in the heart of the Maamturk mountains. My latest tour, with my new friends from California, began in Dublin on Monday, when we began our journey to the magical Ashford castle in Connemara in County Galway. My party were to spend their first night in the west here at this wonderful five star castle hotel, maybe one of the world's finest hotels, located in a wonderful location at the top of the River Corrib in Galway. My happy friends, sitting on a stone wall, with the Corrib Lake in the background. Note the stone walls in the fields below. The west of Ireland is famous for its stone walls. After leaving Ashford, we made our way into Joyce country, and the lovely Maam valley. In this picture we have Denny and Barbara, with the Maamturk mountains, and the lake, in the background. Note the small ruined cottage in the fields below, a home which would have at one time housed a family of anything from ten to fifteen children, or even more. The fjord at Leenane is the most westerly fjord in Europe, and here we have Katie and Kevin, enjoying the sunshine in this special location,as we made our way to Clifden. The Sky Road near Clifden is spectacular, as the views of the ocean below are really lovely. Here we have, from the left, Barbara, Katie, Kevin, and Denny, once again enjoying the glorious sunshine, with the blue Atlantic ocean in the background. Connemara if renowned for these horses, known as the Connemara ponies, a really lovely horse which comes in various colours, grey being the most popular. They are not quiet as big as a full horse, but were favoured by the Spanish cavalry, and it was through the great disaster, when the Spanish Armada floundered in a massive storm off the west coast of Ireland while carrying a large military force, including these horses, that the horses swam ashore and freely bred in the Connemara region, where you will find them in abundance today. They are a great favourite with children as ponies, as they have a lovely temperament. One of Ireland's most popular, and famous, movies was "The Quiet Man", which starred John Wayne and Maureen O'Hara. Here we have Barbara, Katie and Kevin, with the bridge featured in the movie, and now known as "The Quiet Man Bridge." Th town of Lisdoonvarna, in the heart of the Burren , is famous for its Matchmakers, men who have for many years helped men and women find life partners. They have a Matchmaking Festival here still every September, and many people still come looking for expert assistance in this way. Many matches were made here down through the years, for men who came here from the USA seeking an Irish girl as a wife. The Matchmaker Pub in Lisdoonvarna is one of the main venues used by the matchmakers for conducting their interviews,and here we have Denny, outside the pub.What are you up to Denny? False alarm, it looks like the ladies had him under observation. The Cliffs of Moher are just unmissable, and today we spent time here in glorious sunshine once again. Here we have, Katie, Barbara, Kevin, and Denny, obviously relishing their visit. The town of Adare is rated as possibly Ireland's most beautiful town, and we also spent time here today as we made our way to Killarney. This is the old Trinitarian church in the main street of Adare. A view of the street in Adare, with some of the thatched cottages on the right. It was busy here today, but then Adare is also busy during the tourist season. 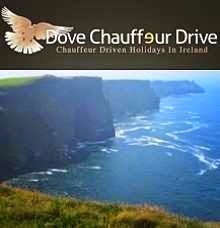 Tomorrow we head for the Dingle Peninsula, another exciting day ahead for us to enjoy.